Crystal Palace History - Allen Street in 1882, after the devastating May fire - with the rebuilt and renamed Crystal Palace Saloon on the Northwest Corner - Fifth Street & Allen. The Crystal Palace history in Tombstone is the example of authentic Saloon history in Tombstone Arizona. The corner of Fifth and Allen Street has developed as the same saloon in one way or another - reinventing itself - since 1800. That's why we love it there! The authentic history. We invite you to come on over to enjoy it. Do you love old West history? Re-live it here - the Crystal Palace history comes alive in Tombstone, Arizona. 2017 View of the Historic Crystal Palace Saloon - We're there, ready to go in for refreshments! After prohibition - back in business as a restored saloon!! All for you to have a Good Meal & a Great Time! The Tribolet brothers were immigrants from Ertach, Berne, Switzerland. There were seven brothers altogether, but three of them were instrumental in this history. The oldest of the three was Godfrey. He moved to Charleston in Arizona Territory. Becoming a journeyman butcher, he learned the business, and began saving funds. He had bigger plans in his head! Godfrey made the move to Tombstone, which he realized was a growing community. With his savings he opened a butcher market at the corner of Allen and Fifth Street. Godfrey recruited his two younger brothers into the business. Manfred was a cooper, 10 years younger. Charles was a year younger. Charles was confident in the town's future, and his place in it. A June 15, 1880 record shows his purchase of a deeded lot in town for $950. It was located in the block south of the Golden Eagle, between Fourth and Fifth Streets. Do you love related historic collectibles? I do! Godfrey planned to specialize in alcoholic drinks and beef products. By late 1879 he was ready. He involved Bernhardt Wehrfritz: a German, and a brew-master, who ended up as the long-term owner. Godfrey set up his corner with an adjacent business - The Golden Eagle Brewery. They did a roaring business. The brewery became the beer wholesalers for all the outlets in Southeastern Arizona. They priced a dozen bottles for $3. The historic Crystal Palace of Tombstone was yet to come! The Golden Eagle Brewery added on wholesale whiskey for $2 to $8 a gallon, depending on the brand. They also carried a base brand of mescal for $4 a gallon. The Golden Eagle had a lunch counter - convenient with their butcher shop attached. Plus patrons could order a beverage. It was really a popular place for the locals! But maybe with such quick success, they didn't know how to handle their funds efficiently! That old time method of putting it under the mattress or under the bed?!! A couple of news reports give us some confusing "details" - about a robbery in June 1881. A discrepancy in reporting the exact dates. Was it Monday, June 6th as reported in Sacramento's Record Union? Or was it Sunday, June 5th as reported in the Reno Gazette? In the middle of 1881 a serious fire lit through an area of Tombstone's business district. From half a block East of the Golden Eagle Brewery, it spread West toward the Brewery corner. On the opposite corner stood the Vizina and Cook building, with the exquisite Oriental Saloon. Much effort went into trying to save the Oriental. That probably helped to stave the flames from jumping the street to the Golden Eagle. For the moment it was spared. On the evening of February 26, 1882 Ben Wehrfritz found his bartender, Mr. Forster, out front of the Golden Eagle. Unfortunately, he was fighting with a local man. Ben was outside to break it up. At the same time a lawman entered the scene to arrest the two causing the fracas. Ben just wanted his bartender back inside. But that didn't work out for the officer. And it went on from there! You can see how that ended up! Read the Weekly Tombstone Epitaph article here!! By the Spring of 1882, Ben's business still rolled merrily along. He continued making it a unique and desirable establishment. You can see the way he wanted to make it a quality gathering spot. Note this report in the Tombstone Weekly Epitaph on April 24, 1882. Ben also placed ads regularly in the local publications highlighting the quality of the Golden Eagle Brewery. About midway between Fourth and Fifth Streets, on the North side of Allen Street, a fire flamed up behind the Tivoli Gardens Saloon. The date was May 26, 1882 - and it was mid-afternoon. It quickly spread Eastward throughout the whole block. All the businesses, with their wooden frames began crackling in the flames. The Golden Eagle Brewery was not spared this time. Most of the business area was burnt away. Only a few buildings were saved by hard working people engaged in bucket brigades. The May 27, 1882 issue of The Epitaph reported that "Smoke from the fire rose from the ruins for several days." But everyone in town kept their optimism. They were determined to rebuild. That included the Golden Eagle proprietors. Ben Wehrfritz got involved in completing his new building on the corner of Allen Street and Fifth Street. On Friday, June 23rd, one of the workers suffered an injury. By April, everyone was busily at work making Tombstone into a thriving community once more. Tombstone's efforts on restoring its downtown business district gave other Arizona local papers a newsy interest. The June 28, 1882 issue of The Arizona Daily Star reported "The whole place seems full of life and the carpenters hammer and the ring of the masons trowel is heard from daylight to dark and sometimes far into the night." Just after the fire Godfrey Tibolet left Tombstone for Santa Fe, New Mexico. He had been the main instigator of the Golden Eagle Brewery. The other Tribolet brothers rebuilt down the block at the corner of Fourth Street. That did not dissuade the brew-master, Bernhardt Wehrfritz, from continuing the business. Since his specialty was brewing, his plan centered on the saloon. On that Northwest corner of Allen and Fifth Streets, his 2 story building began construction. Along Allen Street, eighty feet of frontage presented as the new Crystal Palace, a saloon and gaming parlor. A Crystal Palace in London, for the Exposition of 1851, was famous in that historical time. Was that the influence for the naming of Tombstone's Crystal Palace? In the building Wehrfritz also rented out to a barber shop run by Frank Beluda. The Rockaway Restaurant was also within. The second floor had rooms that were rented out. [Bailey, L.R., 2004, Too tough to die, Tucson AZ]. Dr. Goodfellow ended up with one, and so did Virgil Earp. On July 22, 1882 the Crystal Palace opened its doors. As you entered, the focal point was a goldfish pond with a fountain at the center. The July 22nd issue of the Daily Epitaph described it as spouting "forth streams of pure water." Beginning around 1883 problems started affecting the town of Tombstone. The mines suffered from assorted situations weakening their productivity. Water seeped into mines, equipment broke down. The price of silver decreased. So they lowered miners' wages. Many were laid off. The miners went on strike for a living wage. There was a bank crisis. One of the largest mines couldn't produce at all, until a new system to pump out water arrived. All of these incidents caused repercussions in Tombstone's business community. Finally, in July of 1884, the Grand Central Mine's new pump arrived. A local was optimistically pessimistic, stating the town seemed "dead with no visible present hope of resurrection. Pumps may bring it around." It seems the owners of the Crystal Palace had the same attitude. 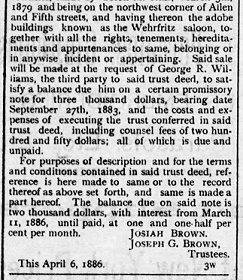 The proprietors in April of 1885 were Wehrfritz and Caesar. They placed ads for a Grand Reopening - planning to revive the business. The town was hopefully breathing in some fresh air! This popular resort has been thoroughly renovated and now ranks as the finest gambling saloon in Arizona. The bar at all times will be supplied with the choicest brands of wines, liquors and cigars, and be presided over by gentlemanly and efficient bartenders. Music every night. The Daily Tombstone issue of Monday, July 20, 1885 gave the Crystal Palace a large write-up. Citing it's history: "it was known in the early days of the camp as the Golden Eagle Brewery and was owned and conducted by Wehrfritz & Tribolet." They went on to credit it as having "the principal sporting house in Tombstone where those who desire to try their luck at any game can be accomodated..." They encouraged a visit, saying "all strangers will find that they will be perfectly at home and be treated courteously by the genial proprietors Caesar & Wehrfritz." From their opening, and all through the historic years of 1885 and into 1886 The Crystal Palace ran regular bit marketing ads in the local newspapers. Occasional mentions were noted when incidents occurred in the saloon. But the town was still on a downhill slide. The new mine pump had problems - break-downs. Work became slow because of that. Tombstone's Crystal Palace Saloon was still placing their regular in-text ads in the local newspapers. A mention was made of the birth of Ben Wehrfritz's first child in late January of 1886. On January 31, 1886 the Tombstone Daily Epitaph published a small notice under "Local Notes" that made one wonder about the health of the Wehrfritz-Caesar partnership. In the very early morning hours of March 12, 1886, there was a robbery at the Crystal Palace. Both The San Francisco Chronicle and the local Epitaph published a news report about it the next day. It sounded a little mysterious. Local police discovered the crime in action. They shot at the culprits, who dropped the cash as they fled the scene. They got away, and weren't pursued. It seems no follow-up was planned to determine who the robbers were, to seek an arrest! A notice posted in The Epitaph on Saturday, April 10, 1886 exposed the partnership's problems. A Trustee's Sale was to be held for the property that was listed as the "Wehrfritz Saloon" and all its property. Shortly thereafter regular ads began appearing in the Arizona Daily Star, out of Tucson. They offered the real estate and barroom fixtures of the Crystal Palace. Then on May 2, 1886 an article apprears in The Tombstone Daily Epitaph to indicate Wehrfritz and Caesar's partnership was dissolved. Caesar is named the only owner of the Crystal Palace. It can be inferred that Wehrfritz and Caesar's partnership was dissolved. Finally on May 26, 1886 a fire totally destroyed the Grand Central Mine's pump, fully halting the mine's capabilities. Many of the town's businesses closed, moving elsewhere. Other mines in town were still operating. But many citizens still struggled. Ben Wehrfritz looked elsewhere to start up his business. The Epitaph let the Tombstone locals in on it. By the next month, according to the Daily Tombstone, Ben was brewing beer in Nogales at a local brewery which he was running. Here are the details: November 16, 1886 Ben Wehrfritz returned to Nogales AZ, after visiting in Tombstone for a number of days. An ad appeared in the November 15th issue of The Daily Tombstone to lure the town's residents over to Nogales to sample his brewery there - with a familiar name! Caesar took on a new partner, named W.H. Curnow. In March 1887 they began working on the Crystal Palace, fixing it, again reinventing it as their own business enterprise. On May 3, 1887, an earthquake centered in Sonora Mexico historically rattled Tombstone. The Crystal Palace's chandeliers shook heavily. The light's globes were knocked from their holders and crashed to the floor. It was another hit - now from Mother Nature herself! People moved out, many to Bisbee and other outlying towns where they could get work, especially in the surrounding mining towns. By 1890 the population was down to 1800. A far cry from the booming times of 5300+! It's difficult to make a go of a service business without the local population's support. So many businesses closed, many stores, many saloons, many restaurants. The Crystal Palace kept its place in history - it kept hanging on! Tombstone's Crystal Palace Must Change Again! With all the town's financial problems, eventually it became problematic that the Crystal's lease-owners couldn't get enough business to make a go of it. Ownership changed hands again. In the Tombstone Epitaph of October in 1887 a small Territorial News piece made the announcement. A Tombstone paper, whose readership was dwindling - and its survival doomed - printed a sarcastic comment which compared the town's local establishments. In particular it mentioned the Crystal Palace in Tombstone. It was then reprinted in Tucson's Arizona Daily Star on Christmas Day of 1877. On Feb. 8, 1888 The Tombstone Prospector reported that a new sidewalk had just been built in front of the saloon, and the same was needed in other places in town. On April 12, 1888 The Epitaph noted that Julius Caesar would soon be running the Crystal Palace! We're still researching the Crystal Palace history to determine what we can discover. We're open to information anyone can provide - please contact us about what you may know! In 1889, Julius Caesar is referenced with an ad about the Crystal Palace Tombstone! A mysterious notice appears in the Tombstone Daily Epitaph!! A short time later it's discovered what the startling event is! Another announcement appears in the Epitaph. A new singer, Miss Wood, has been enlisted to provide entertainment at the Crystal Palace. Creative marketing at its finest in the historic 1880s! The Crystal Palace had a raffle for a sewing machine - one of the newest inventions of the era!! Toward the end of the year, a different singer was hired. First mentioned in The Daily Epitaph on November 22, 1889. They gave Miss Cushman notices in the paper under "Local Happenings." The last one was on December 28, 1889. With the turn to the New Year of 1890, the Crystal Palace had few mentions or ads in the Tombstone Epitaph. Instead their choice of advertising went to The Tombstone Prospector. The Tombstone newspapers of the day, as well as the local businesses, historically aligned with each other politically. The Epitaph mentioned the Crystal Palace again when they reported on an incident that occurred there. It horrified their editorial staff, and they commented, as well as reported on it. They asked for some action! On the same date, though, they also mentioned the Crystal's singer - Annie Cushman. They noted she "is sure some swell singer." What do you think of that? Use our comment section below - to let us know! The Epitaph mentioned the new Crystal Palace singer, Edith Smith. First, on May 31, 1890, it noted she was a hit! But on Friday, June 7th they reported on an incident surrounding her singing appearance. Two men admirers had a fight over her. While drinking, lovingly watching her singing, they vied for her attentions and one hit the other with a beer bottle. It cut his head so he needed stitches! In early July an article in the Tombstone Prospector promoted their new singer, Miss Smith. They also called it a Concert Hall. An effort to get the general public in for entertainment was underway! At the same time, an area in the back of the main bar was rented out to P.B. Warnekros for his enterprise. He was supplying the latest popular beer - Schlitz, along with ice to keep it cold. He began advertising that the Crystal Palace would have great access to that wanted beverage! Suddenly a surprise announcement appeared in the local press - in both the Prospector and the Epitaph. The Crystal Palace was under new management once again! Deducing from the Tombstone Weekly Epitaph's announcements, they supported this change. Although they're not yet carrying advertising, they now begin mentioning the Crystal Palace again. The end of July 1890 also saw an end to the Crystal Palace's advertising with the Tombstone Prospector. Yet they did not immediately pick up advertising with the Tombstone Weekly Epitaph. From our research of the history, we can't see that Joe Bignon invested in much, if any, paid newspaper advertising. However, he wasn't against having any free publicity any publication was willing to give him. An occasional note was placed in various area periodicals. For instance, when a new gambling game began at the Crystal Palace, The Tombstone Prospector placed a small article. It was an evening Keno game! On the 1st of February, the Weekly Epitaph posted an article concerning a well-known local resident, C. Hattison of Eighth Street. Someone found him dead at home. It was surprising, as he was only 38 years old. He was last healthy and well, seen 3 days prior at the Crystal Palace. The Tombstone Prospector on 2/12/1891 wrote of miner Louis Holsey. He'd recently killed himself after killing his wife, in Kansas. In December 1890 Holsey had run a Faro game at the Crystal Palace for a short while. The Weekly Epitaph also reported on the Holsey incident in a February 15th article. It gave a lot more background information on his family, and the situation. Some said he was a quiet, solemn man. Others said he'd threatened them. But his wife was pursuing a divorce, and seeking evidence from Tombstone witnesses regarding his history of violence toward her. The Weekly Epitaph ran a story on Sunday, May 31 about a local trial. During deliberations, a sheriff on the jury was a hold-out for the defendant's innocence. That was locally unpopular. When in the Crystal Palace, friends of the defendant violently accosted him. A notice posted in the Tombstone Weekly Epitaph shows that ice storage was still available in the back area of the Crystal Palace. Now the agreement was with the Southwestern Ice Company. The next article published promotes a raffle sponsored by manager, Joe Bignon. Maybe he had a plan in mind - because about two weeks later two announcements appear on the same day in The Epitaph. Joe Bignon is retiring from his position at the Crystal Palace. A separate Epitaph article states that the Crystal Palace will be closing for "extensive repairs" with an expected reopening date of July 1. The posting promotes it as an enormous undertaking to make the Crystal a large venue! But July 1 comes and goes with the Crystal Palace Saloon still closed. On July 24th The Epitaph posts an article saying it will be open soon. They're working on wallpaper and ceilings. The Tombstone Weekly Epitaph prints a warning notice on Page 1 of its publication. It doesn't mention who is responsible for solving this issue! And it's now all the way into the middle of 1894! On September 1 of the same year, The Arizona Weekly Citizen publishes a substantial analytical piece by someone with the byline "P.H." It's entitled "Tombstone Today." It speaks of "rows on rows of empty cabins." And "whole blocks of saloons and stores of considerable magnitude forsaken." It includes saloon names such as "Crystal Palace" and another well known - the "Fashion." And why? It explains, with the heading of its paragraph: "Tombstone has had a great decline." With further note, it tells of silver's price drop, miners leaving, merchants as well. The article commends those left in Tombstone as hopeful and resilient. The conclusion to be made, is that with great hope the Crystal Palace was to be reopened after Joe Bignon left. But the financial situation must have fallen through, and it never did get off the ground. At the end of 1895, the Crystal Palace is finally mentioned in the Arizona media - in The Tombstone Weekly Epitaph. It is again sold - by a judgment of the courts to Martin Costello. A Phoenix issue published an article by Pittock, on September 16, 1897. A historical look at Tombstone, it reviewed the current situation back from its heyday. It listed the 1897 population as about 1000. That's a few hundred less than it presently has! Pittock mentions the Crystal Palace. Saying the "corner last occupied by the Crystal Palace saloon, northwest corner of Fifth and Allen streets, less than three years ago retned [sic] for $150 monthly." [Arizona Republic, Sept. 16, 1897, p. 4] We can construe, then, that the Crystal Palace was still not open in late 1897. Looking through news items to the end of the 1800s - nothing more is seen by us referencing Crystal Palace History in Tombstone Arizona. A very small item appeared in Prescott's Weekly Journal-Miner. It appeared under their "Saturday's Daily" column. It seems the Crystal Palace will reopen - if their notice is accurate! Right about that time, some rejuvenation was happening in the business community of Tombstone. And as the tiny article noted, that would now be the eighth saloon in town. A small article published on May 18, 1902 in the Weekly Epitaph mentioned the outlook. It focused on the Oriental Saloon being refurbished to open again by June 1. But it also mentioned the Crystal Palace was expected to reopen. Another thing that happened in May - women were outlawed from saloons! It was the result of a "morality" political action going through the country. And it was men who had the control - as women could not vote. The Tombstone city council passed an ordinance, effective May 20, 1902. It stated: "no woman shall be allowed in the saloons or adjacent rooms, either as a guest or employee of the place." Violation would mean a fine of $25 to $50 or imprisonment of 10 to 25 days. However - to note, for the men's convenience - it did not apply to the red light district! It still continued through January of 1907, when prostitution was outlawed. It took a little while, but work did begin on the Crystal. The Epitaph noted on November 9 of 1902 that remodeling was happening. That very day work on a new ceiling was started. The anticipated opening date was just under a month away. It didn't go on time - but another announcement appeared In The Epitaph on December 21, which named the new owners. In that same issue, the Grand Opening is announced. The Tombstone Weekly Epitaph then printed a small review of the Grand Opening. On December 28th they reported it "was well attended." They called it a favorable "class of resorts in the west." The Bisbee Daily Review July 26, 1903 issue reports that one of last year's group of Crystal Palace owners has divested his interest in the saloon. Elwood Madden is said to have moved on to "The Turf." By September of that year, he's noted to be very ill with typhoid fever. In early August 1903, John F. Anderson is listed as one of the Crystal Palace proprietors. It can be wondered if he replaced Madden. Another proprietor is mentioned in the Weekly Epitaph on May 1906 - Edward Wheeler. Then finally, by August 1906 an announcement appears in the Epitaph. Only J.M. Speck remains as Crystal Palace management. the Crystal Palace is mentioned with reports of the travels of lease-owner, John M. Speck. In February he visits family in Los Angeles. In March he visits Silver City, NM. In July he travels to Philadelphia for a convention. But afterwards he returns to Silver City, NM - where he'll "remain for some time." That year Tombstone's economy was struggling. No other Crystal Palace history reports have been uncovered by us. Until we hear of Speck's marriage break-up under somewhat strange circumstances. See it for yourself in the 1909 news clipping! No reports by us are found early in the 1910 decade. A hint of what happened can be unraveled from a story published in the Weekly Epitaph of June 28, 1914. It mentions John Maddon [sic] returning to town. They remind readers he was the historic Crystal Palace owner along with John M. Speck. They note in the article, "when the camp closed down several years ago the saloon was closed." From the wording it indicates it closed after these owners were done with it. The Crystal Palace property is owned at that time by Mary Costello, as her husband Martin passed away on September 15, 1911. Gambling had been outlawed in Arizona beginning in 1907. The Costello estate sold their gaming tables and roulette wheels to an establishment in Naco, Sonora Mexico in 1915. Prohibition was passed in Arizona, enacted on January 1, 1915, even before it became the national law. Voters approved Proposition 203 in 1914, influencing what became of Tombstone's saloons. Eventually, Mary Costello sold off the original, beautiful bars of the Crystal Palace. A Naco, Sonora saloon owner, F.J. Keogh, purchased the bar, back bar and all the fixtures from the Crystal Palace Costello estate. He also bought the huge ice box from the rear of the saloon. A truck carted it all across the border on June 2, 1923. The Crystal Palace bar was installed in the White House Saloon in Naco, Sonora. At some point unfortunately, that saloon succumbed to a fire - and the bar along with it! Other equipment went to various saloons in town. Thus on January of 1915, a whole new avenue for the Crystal Palace Saloon came into play. Joe Norcross took ownership of its lease it at the end of the month. Joe expressed an optimistic outlook for the town. He had The Crystal Theatre ready to go on February 26th - and he sponsored a ball afterwards! Then mid-year, he sold out to James and Tony Giacoma. They were former miners, immigrants who arrived in town around 1909. They carried on the same type of productions as did Joe. Things were looking up financially for the town. Not that it was booming, but it had become more stable. The local mines were consistently running, the housing market was full, hotel rooms were booked, banks were doing well. World War I had begun, which contributed to this stability. The U.S. didn't get involved in the war until 1917, and the military draft was instituted. Tombstone was distracted with their patriotic effort. And then again the commercial parts of town began to suffer. People started moving away, until the population was a little under 1000. Tombstone's First National Bank - Mary Costello, President - just missed having to close! She, herself, took action to save it. But restaurants, stores, other enterprises were closing - one after another. The Secretary of the Commercial club, Arlington Gardner, began thinking of something to save the town - tourism! Author Frederick Bechdolt came to town in mid 1919 and met up with Gardner. This fomented a series of Saturday Evening Post articles about Tombstone AZ. Then he wrote a book, When the West Was Young. While in town, he exhorted for and participated in restoring Boothill cemetery. Bechdolt promoted Tombstone tourism, even if inadvertently! In 1922, the Giacoma brothers felt the buzz. They invested in refurbishing the Crystal Theatre. The Epitaph mentioned how others along Allen Street were also getting into the action! The news was also featured in the Bisbee Daily Review and Tucson's Arizona Daily Star. At the end of the year the Crystal Theatre was still operating according to the El Paso Herald. They published an article on December 9, 1922 reviewing Tombstone's history. It mentioned the "Crystal Palace gambling hall is a prosaic Crystal theater, showing moving pictures..."
Gardner enlisted help from fellow Tombstoner, historian George H. Kelly. They wanted to stage a festival to promote the town. They decided to commemorate a 50 year anniversary for the year of 1929. Scheduled for October, it was the first "Helldorado." Except the Crystal Palace could only sell soft drinks - because it was during Prohibition, which didn't end until 1933. But it was renovated for the Helldorado celebration. The most popular reenactment was The Gunfight at the O.K. Corral. It was a feature that made newspapers throughout the country. Over 6,400 people were in town for the event. Even so the Phoenix Gazette was a naysayer. Was it a one-time event for a dying town? - "the final curtain has dropped in the Bird Cage and the last lights have gone out in the Crystal Palace." The big stock market crash that week may have influenced that feeling! Mining barely held on for some folk; up a little, then down again over the years. Depression years were severe for those in town. Tombstone lost the County Seat to Bisbee in 1930. That historically was another severe hit! But in that year, Tombstone resident Walter Lombardi bought the Crystal Palace. Gardner continued to promote Tombstone, along with help from new owners of The Epitaph, Walter and Edith Cole. He got it promoted via the cross-country touring route - U.S. Hwy. 80. It was called the Broadway of America. It made Tombstone a well-known stopping point by those touring from East of the Mississippi and foreign countries. In 1936 Gardner, and the Coles - along with other pioneer Tombstoners, Mary Costello, Ethel Macia and Margaret Cummings, continued to promote Tombstone's historic buildings. Those included the Crystal Palace, and 2 other saloons. Plus the Bird Cage, Boothill, Nellie Cashman's hotel, the world's largest rosebush, Schieffelin Monument, the Courthouse and others. When the U.S. entered WWII in 1941, Tombstone's population was just 822. It again was a terrible economic time. Mining was virtually done. The vintage buildings were on sale for bargain rates! There was a slight resurgence with a unique medical center opening in 1945. Another tourist revival was sought after the war ended. In 1948, a travel boom on U.S. Hwy. 80 was bringing travelers to town again. Lombardi began to restore the historic Crystal Palace Saloon. He hired Alan Branson of Associate Artists and Decorators of Tucson to recreate the back bar. The Grand Opening was on May 8 & 9, 1948. The Epitaph's May 13, 1948 write-up gave descriptive accolades: "grandeur and splendor for which it was noted during the heyday of Tombstone." In 1950, Lombardi was involved in a restoration committee to look into forming a restoration commission. They aimed to include 6 square blocks of downtown into a historic district. The Tombstone Restoration Commission became official on January 28, 1950. Governor Garvey came to town for a banquet, reenactments were staged, Rudolf Valentino's silent film Son of the Shiek was shown in the Crystal Palace Theater. The Commission was fruitful in getting the memorable nature of the town inscribed into law on April 10, 1954. It was City Ordinance 146. It formed a zoning commission and restoration zone. A close call came from an Allen Street fire on May 23, 1957. Starting in back of the Cattleman & Miner's Bar, it seared down the street, consuming 60 feet of the block: two more businesses. It approached the Crystal Palace, and nearly got it before it was put out. Three men from the Eastern U.S., with an interest in history, and in making money - formed a corporation called Historic Tombstone Adventures. Their goal was profiting from maintaining and promoting area features. Around 1963 they built a hotel opposite Boothill, and purchased quite a few consequential properties. Among these, and their first priority, was the Crystal Palace Saloon. They reworked the outside area to appear historically authentic. As it did in 1882, with its second story rooms. The refurbishment took 5 months. All told for purchase and renewal, it cost $190,000. [Bailey, L.R., 2004, Too tough to die, Tucson AZ]. The historic Crystal Palace has since shifted ownership a number of times. The importance of Crystal Palace History as a Saloon and then as a theater in Tombstone's ongoing adventure is something you can relive today. Stop in to envision what has gone on there over the years. See the re-creation of the beautiful, historic bar & back bar. Take photos - and Give Us A Look at them, if you would!! Visit Tombstone to live Wild West history!